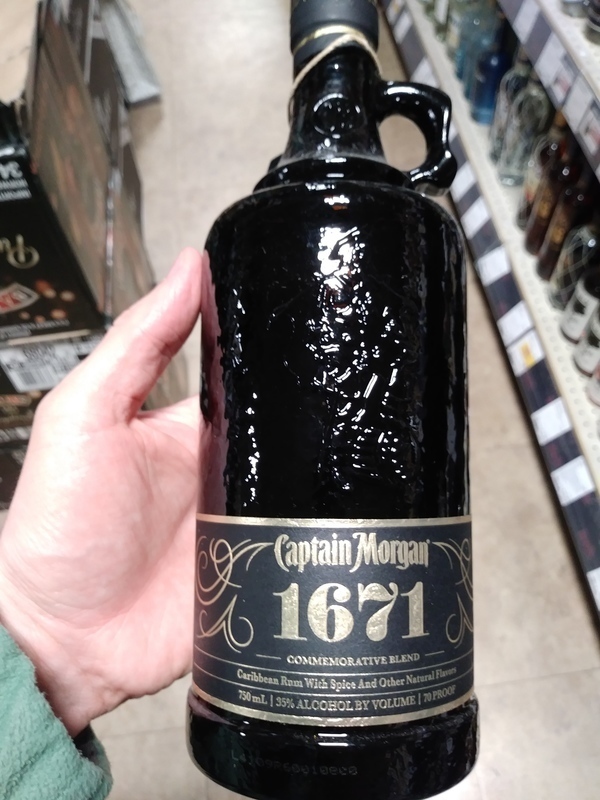 Have you found an online vendor selling Captain Morgan 1671? It is quite smooth, better than I would expect from a Captain Morgan product, while still maintaining the signature spicy finish of Captain. Definitely on to experiment with more. Mixes great with coke and it's great to bring to a party. Doesn't have quite the bite that regular captain has. The main thing on this Rum is perception.. Regular Captain Morgan Rums are taking down this type of high standard ones. Another important fact is probably misconception on purpose of this Rum.. This Rum is a really good fit to mix it with cola. Also doing surprisingly great drinking alone unlike other Captain Morgan Rums. Color is nice caramel color. Overall it is a high quality effort and surprisingly amazing price. Hope they'll continue to sell it because i feel like i find my everyday rum&coke rum.. I haven't been able to find this rum in my hometown of Longview, TX for over a year. I was told that it wasn't being produced anymore. Well, to my pleasant surprise, I'm spending the night in Ft. Worth and the liquor store across the street from my hotel has it! Woot woot! I am so excited. The guy there told me he had just ordered it a month ago and had no problem getting it. I had also found it in Austin last year so Idk why I can't find it near me. This is my favorite rum. It has a hint of chocolate in the after taste and is very smooth. My friends and I drink it neat (sometimes I like to squeeze a little lime into it). Its getting hard to find around here and I wish they would start offering it again. Normally I am not a fan of Captain Morgan, even private stock is not really enjoyable. However this rum really surprised me. Smooth and mixes quite well with coke. I will definitely be getting this again. One of my absolute favorites. Very smooth caramel flavor. Delicious easy drinking. Inexpensive but hard to find. Unfortunately I believe its a limited edition. I think most people who have tried this agree. It was better than expected. I was surprised how smooth it was. Finally this rum is available at a liquor store near. I really like the bottle, and I would classify this rum in the "flavored" category. Very sweet, fruity with very distinct aromas, It reminds me a lot of Legendario Élixir de Cuba. A favorite. I'm going to go out on a limb here. My family tradition is to take a shot to start a football game. For my wife that's whiskey, and this bottle finally gave me a satisfying counter. This rum is more complex than your standard mixer bottle, but isn't so fussy to stop me from getting the shot glass. It's VERY sweet and dangerously smooth. Don't get the cola (or Dr Pepper in my case) out, or you will regret the morning. But for what I enjoy it for, it's perfect. Normally I keep a bottle of original Captain around the house for a quick drink with some cola so when I grabbed this I was quite happy. It mixed very well, and was smooth on its own. I started what would be my Summer of Rumn with 1671. This offering was well balanced, not to sweet, not to tangy. I am not sure they will produce it again, I wish I could find another bottle. As an artist I really liked the packaging, very nice looking bottle compared to the others on the shelf which surly influenced my choice. I was born 300 years too late. My name should be on this bottle. I love the dark caramel and I taste chocolate notes. This 1671 is one of the best made. I wish I could find it near me. Sugar: 40 to 45 gpl. I was pleasantly surprised by this rum and admit that I bought it for the bottle plus this rum was on clear out pricing as it's been discontinued by the LCBO in Ontario. The 1671 has more spice and flavour than the Captain's Private Stock, plus it is not as sweet. Goes down quite easily and has a nice warm afterglow. It matches up with other spiced rums in the market and in my opinion is better than the Barcardi line. I might have to get another bottle before it's gone. Love this rum, smooth as silk, great vanilla finish on the rocks, can't be beat as a sipper. Actually not a bad rum. Ok to sip but more of a mixer with coke. Smooth taste straight and was good with coke. Vanilla taste, no throat burn, and pretty long after taste. Nice bronze color. Slightly sharp with a cherry/sherry finish on it that really grows on you. Not as sweet and caramely as Zaya, but definitely an interesting finish. I am not a Captain Morgan hater though I prefer Sailor Jerry's at the bar. Not the Captain Morgan most know, it has a much smoother taste and nose though not a sipper, There is a dominant taste that is different than most spiced rums, pleasant but better in coke than citrus. Will keep it in my bar for that unique taste but believe Bacardi Black Oak is more rounded overall. Enjoyed a glass of Captain Morgan 1671 rum with my friend during a 5,000 mile road trip across 18 States. Bottle and label design look nice and unique, not the traditional low end Captain Morgan style. Amber color. Strong caramel flavors straight to your nose and palate. Quite a burn at the end. This is still a mixer rum, although its the best Captain Morgan has to offer. For me it starts with the aroma going to Simply the taste of the spices and it's smoothness and it ends on a wonderful finish.